I am Vinay Deore. I purchased srt mobile. When I purchased this mobile that time i got an offer of extended warranty and back cover. Now, My mobile display not working. i went to the service center they filled up my job sheet. but they told me, you have to paid money for that & smartron not provide extended warranty. Is that correct?...... they told there system shows paid service for display replacement. what i can do?.......... They are not accepting my mobile in extended warranty. They also told me give the email proof from smartron for extended warranty. so you can check the attachment of Flipcart invoice copy and reply on this mail. 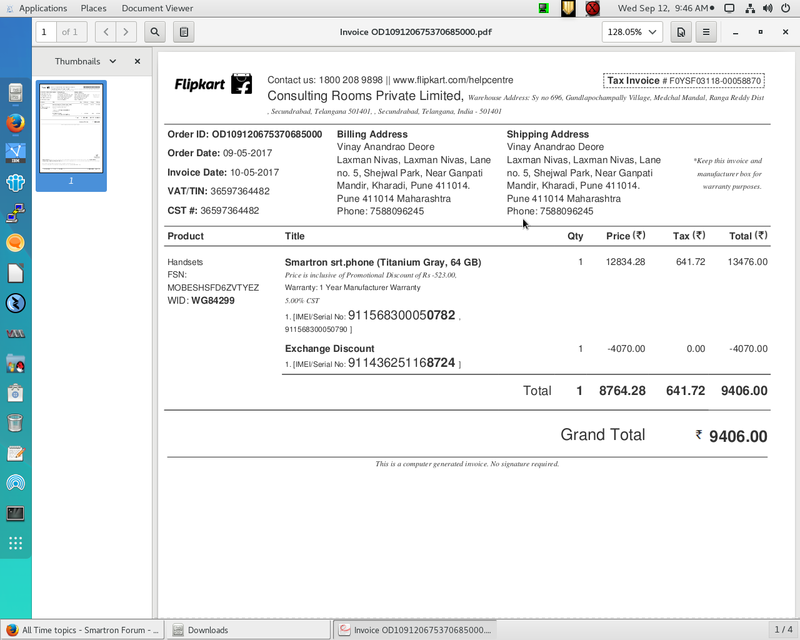 I forward attachment of my mobile order Flipcart invoice copy Screenshot. Please look into the issue and solve it as soon as posibile. @vinaydeore Please contact @Abhishek_TV and @tcare by tagging them in your message. Our @tcare team will look into it and provide you a solution. You may please wait for a response from the @tcare team as you have already sent a mail. Display is not physical damage. It also check by smartron service center. it automatically stop working.